I've been digging through the archives and thought I would share this. This is the first piece of comic book art I ever had published. 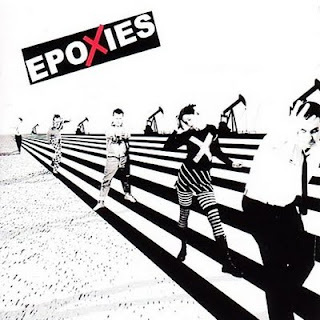 This was in 1986, or early 1987. This was the inside back cover of Thundermace #3. The image in the center of the page is mine (well, mine and Fred's). This one of the very rare occasions of my pencils being inked by Fred instead of the other way around, although if memory serves the big skull in the background was really lightly sketched in, so a lot if not most of the detail there is Fred's. 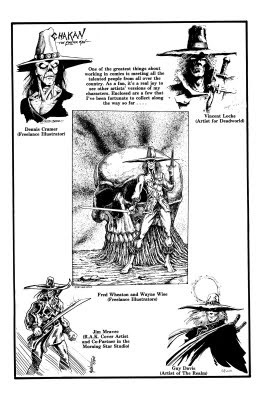 It's a drawing of Chakan The Forever Man, one of the characters Created and published by Robert A. Kraus of RAK Graphics. Rob is the hardest working man in comics and has been since the Black and White comics explosion of the mid 1980's. I'm pretty sure he has been at every convention I have gone to since that time (and every one you've ever gone to as well). His book Thundermace was, for a brief time, one of the highly-sought-after books in the black and white market. Chakan originally appeared as a backup feature before going on to star in his own book and to become the star of a Sega Genesis video game. We met Rob at Mid Ohio Con in 1985 or 86 (several of the Mid Ohio Cons blend together in my memory). At the time Fred and I were neck deep in the comics business, working hard to get our own book published (that's another story I'll recount here some day). Rob was one of the nicest guys in the small press comics world and was incredibly supportive. He asked us to do an illustration of Chakan and next thing we knew we were published. If you look closely at the other drawing on the page you can see that we're in good company. There's a piece by Vince Locke, original artist of the Deadworld comic, and another by Guy Davis who drew many issues of Sandman Mystery Theatre and the Hellboy spinoff series B.P.R.D. (among many, many others). Rob is still out there, working convention after convention. If you see him say hi for me. I've been on an Archie kick recently. Yeah, that Archie, the perennial teen humor comic. I read Archie when I was a kid. I read pretty much all comics democratically. I watched the Archies Saturday morning cartoons. 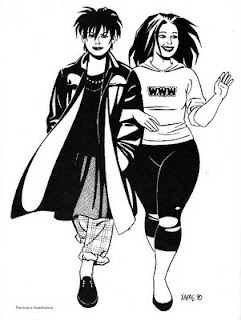 The Archie comic Madhouse changed its name to Gladhouse and served as my introduction to hippy culture (through the parodic eyes of the older men who wrote the book). But, like most people I guess, I outgrew Archie. Archie and the Riverdale gang didn't care. They continued to be published and have their adventures for a new generation without me, just like they had been doing for years before I was born. 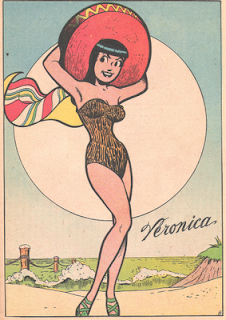 Archie first appeared in Pep Comics #22 in 1941 and got his own title in 1942. It's still being published, making it the third longest running comic in history (the other two being Detective Comics and Action Comics respectively). 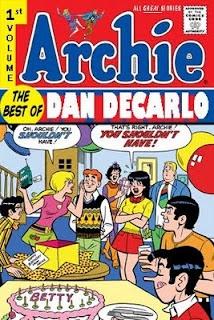 Over the years Archie has produced a number of wonderful and influential writers and artists, too many to go into detail here. My own comics art has been moving into a more simplified and iconic direction, and the Brix strip I've been archiving here is the best example of that. As a result I've been looking at a few of these artists more closely. Bob Montana was the original artist on the series and established the basic look of the characters. 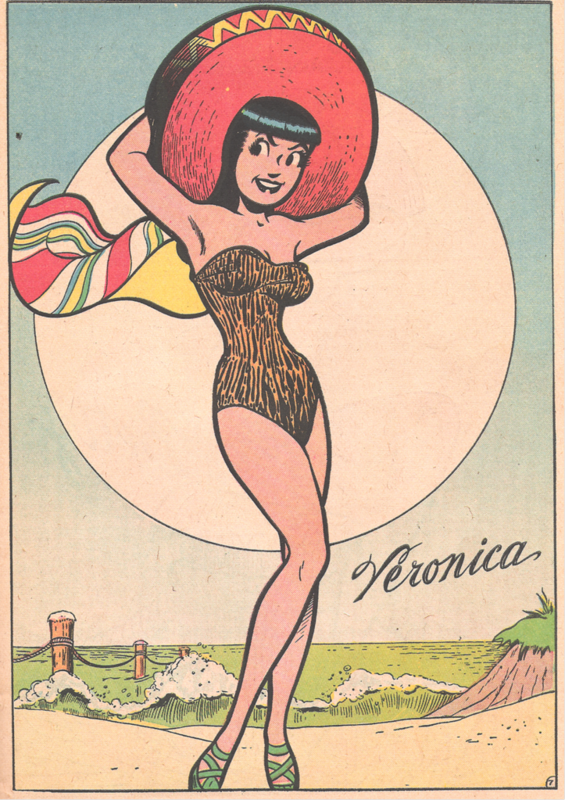 But it was Dan DeCarlo who solidified the style and became the most recognizable Archie artist. I really love his clean lines, uncluttered composition and solid inks. I also really love the work of Harry Lucey. There's a wackiness and animated feel to his take on the characters that I find charming. I came to these artists backwards. 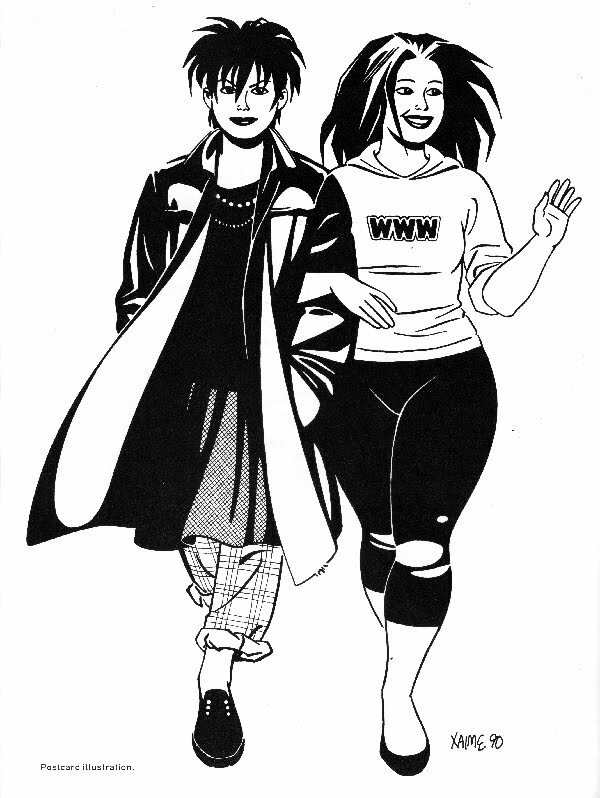 I've never hidden the fact that Jaime Hernandez of the comic Love and Rockets has been a primary influence. I think that's pretty obvious in any of the various Grey Legacy projects that Fred and I have done. Jaime has always talked about the influence of DeCarlo and Lucey and it took me awhile to really go back and look at what he was talking about. I'm glad I did. And it's more than just the art. The stories I've been reading are great. 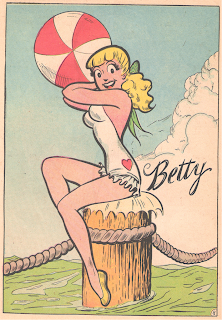 The simple love triangle of Archie, Betty and Veronica lends itself to endless variation. The relationships and friendship among all of the characters is truly timeless. Many stories turn on a very simple punchline, some completely subvert traditional storytelling and cross the fourth wall into the surreal. In the late 60's the Archies were a real band. 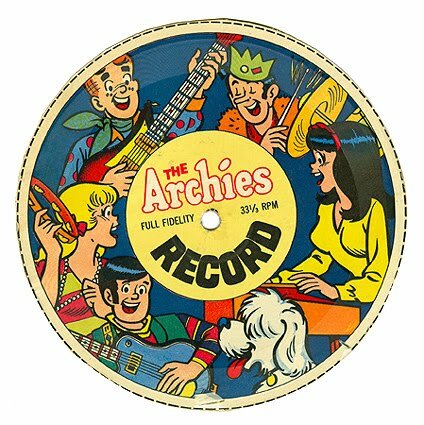 Okay, they had actual humans playing the instruments and singing, but they were billed as The Archies. The song Sugar Sugar was the #1 pop song in America in 1969. There was this weird promotion where breakfast cereal boxes would have a playable record on the back of the box. The grooves of the record were actually embedded in the cardboard with some kind of plastic/vinyl. You could cut the record out and play it on your record player. I remember doing this with the Archies. 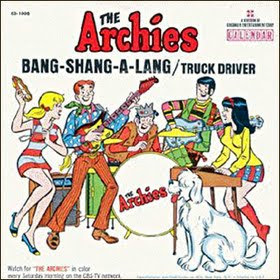 I also remember buying the single of Bang-Shang-A-Lang, with the b-side of Truck Driver. I haven't heard those two songs since I was 9 or 10 years old. Yesterday I downloaded an Archies Greatest Hits album. I still knew all the words to Bang-Shang-A-Lang. 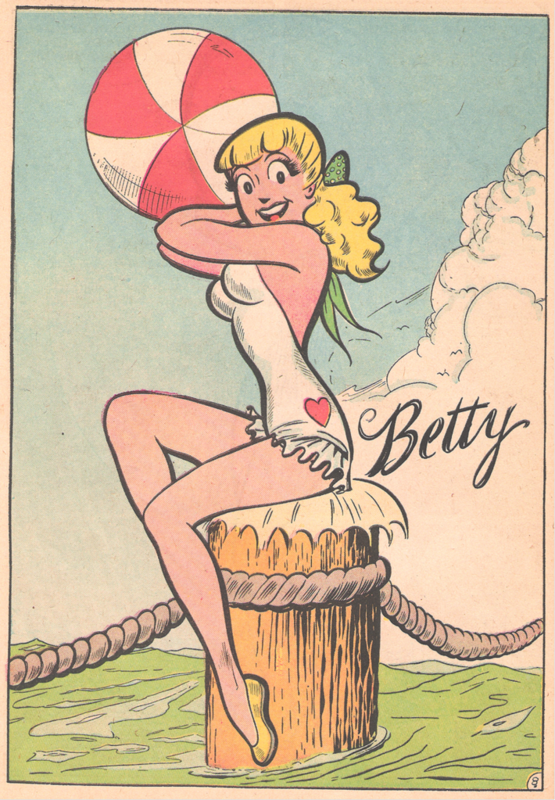 For the record, I'm neither a Betty or a Veronica. I completely understand Archie holding on to both of them.